Explore the secrets of pirate radio in this special access discussion at The City Reliquary. Though you can’t see them, the skies above New York City hold a tangle of transgressive, culture-bearing radio signals. At this very moment, secret rooftop transmitters are sending them winging imperceptibly across the five boroughs. These stations, often called pirates for the way they commandeer the airwaves, operate without a license. Stations like Triple 9, Fierte Haitenne, Kol Hashalom and Radio Gospel Train risk fines, confiscation of equipment and even arrest to keep their signals flowing. David Goren, radio producer and creator of the Brooklyn Pirate Radio Sound Map, has been researching New York City’s pirate radio scene for the past five years, working with station staff and listeners on both sides of the legal divide. 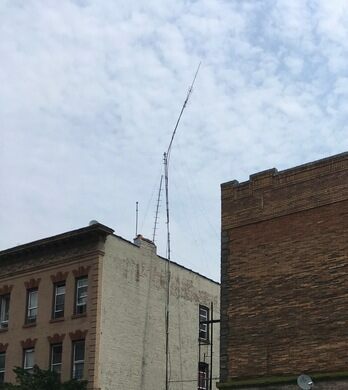 In this informative talk, David will explore the cultural and political forces driving pirate radio in NYC since the late sixties via live tuning, archival recordings and excerpts from his new radio documentary for the BBC World Service. As part of the evening, David will also be joined by two special guests: DJ Cintronics from WBAD, a seminal and influential hip hop pirate from mid-90’s Brooklyn, and Dan Lewis who was part of Queens-based Stereo Nine FM, a progressively political pirate station of the 70’s and 80’s. Complimentary beer will be provided by Brooklyn Brewery. The City Reliquary is a not-for-profit community museum and civic organization located in Williamsburg, Brooklyn. Through permanent displays of New York City artifacts, rotating exhibits of community collections, and annual cultural events, The City Reliquary connects visitors to both the past and present of New York. This event is 21+. Please bring I.D. Complimentary beer will be provided by Brooklyn Brewery. Seating is first-come, first serve. The City Reliquary is ADA accessible.